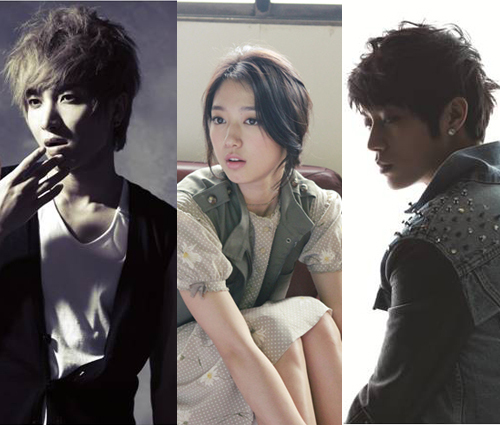 The next generation Hallyu Queen Park Shin Hye and world wide sensations Super Junior's Lee Teuk, and Beast's Yoon Doo Jun were picked to host the 2011 Melon Music Awards. These three top Hallyu stars were appointed MCs in that they are in the center of the Hallyu craze. Super Junior held concerts throughout Asia and had expanded to Europe as of this year. Beast will begin their Southeast Asian tour in December. In addition, Park Shin Hye had already starred in an overseas production; her drama "Sensation World" or "Hayate the Combat Butler." Their activities overseas had made them top contenders to MC at this year's Melon Music Awards. Representatives from Melon Music Awards stated that this year's show will be different from other years in that they will incorporate both musical aspects and professional award show aspects into this program which will included amazing performances and stages. Park Shin Hye was a guest MC with Jang Keun Suk when he hosted the show back in 2009. The awards ceremony will be held on November 24th at 19:00 in Gymnastics Stadium in Olympic Park. The show will be broadcast on MBC Drama net, MBC Everyone which will be on YouTube to be broadcast worldwide. i'm happy to see her busy in the ebiz this means we get to see her often. and i'm sure it will either be FTIsland or CNBlue that she'd get to meet for the MAMA awards for BEST BAND...i love both and would love to see her with her co-ANJELLs! i hope both of these guys will complement her well!!! wasn't it yonghwa and heechul who hosted the melon music awards with shin hye last 2009?? The ever beautiful Hallyu Queen Shin Hye hosting the Melon Music Awards with two good looking men!! Can't wait to see it! she definitely the beautiful Hallyu Queen...will she meet Yong Hwa again? I wanted to ask about the time, is it in GMT or Korean time? Also, is it going to be live on youtube live? Our Princess ShinHye is so busy. that makes me sooo happy. i love seeing her on this site, it makes me smile knowing that she is one of the hallyu wave leaders.